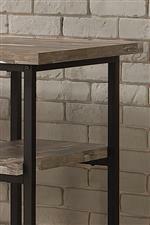 Create a relaxed work space with a rustic modern design aesthetic with the Skelton home office furniture collection. The desk with four shelves and coordinating bookcase feature a black finish metal frame complemented by distressed finish tops and shelves. Browse other items in the Skelton collection from Nashco Furniture - Nashville in the Nashville, Franklin, Brentwood, Clarksville, Green Hills, Davidson County, Williamson County, Tennessee area.